The irresistible handmade Yummy Scrummy chocolate pizza is the perfect party pizza for all ages! 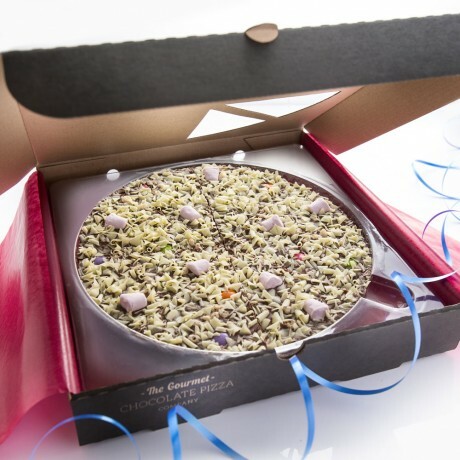 A slim trim crust of Belgian milk chocolate with a topping of rainbow drops, marshmallows and rice puffs all finished with white chocolate curls. Available in 7" and 10" sizes. 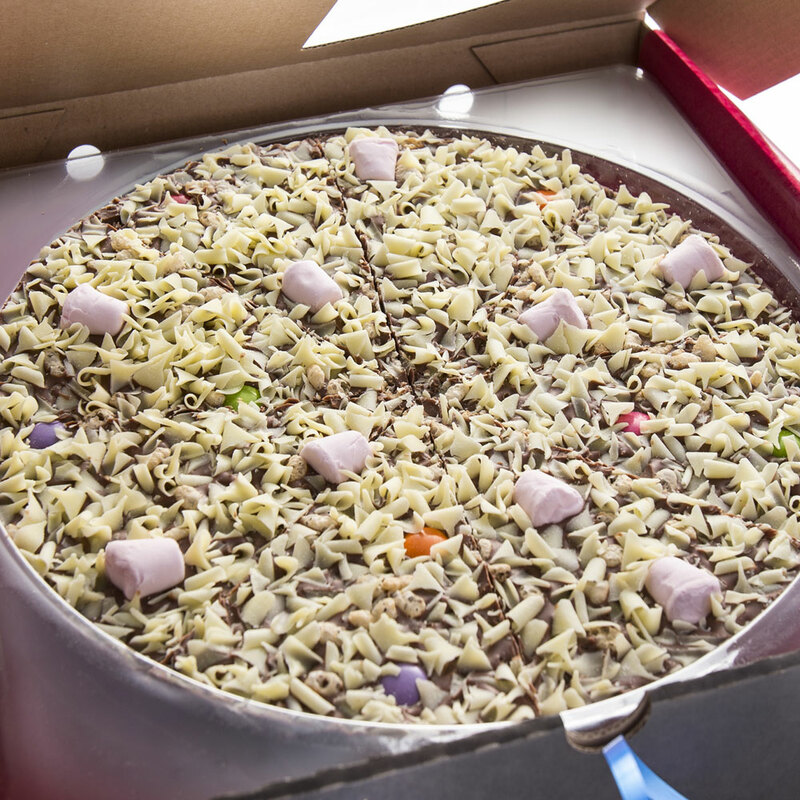 Shelf life: This pizza has a shelf life of 12 months. Store in a cool dry place. Belgian Milk Chocolate-min 33.6% cocoa,20.8% milk solids, sugar, cocoa butter, whole milk powder, cocoa mass, emulsifier: soya lecithin, natural vanilla flavouring. White chocolate curls: sugar, cocoa butter, whole milk powder, whey (milk ) powder, lactose (milk), emulsifier: soya lecithin, vanilla extract. Marshmallows: sugar, glucose syrup ,water, cornflour, beef gelatine, flavourings, natural colour (beetroot red). Rainbow drops : Whole milk chocolate (53%): sugar, cocoa butter, wholemilk powder, cocoa mass, sweet whey powder (milk), lactose (milk), skimmed milk powder, emulsifier: soya lecithin, vanilla extract), sugar, colours: E171, E163,E100, E141,E120, thickener: gum arabic, glucose syrup (wheat/sweet corn), gelatine, vanilla extract, glazing agent: beeswax and carnauba wax. Whole milk chocolate: (cocoa:30% minimum). Puffed rice: Rice,Sugar, Salt, Barley malt flavouring, Niacin, Iron, Vitamin B , Vitamin B2 (Riboflavin), Vitamin B1 (thiamin), Folic Acid, Vitamin D, Vitamin B12. This product contains milk and soya. Made in an environment that uses nuts. Not suitable for a vegetarian or gluten free diet. This product is dispatched by The Gourmet Chocolate Pizza Company. This item has a shipping weight of between 500g and 1,000g depending on the options selected.